Perfect for football season!! 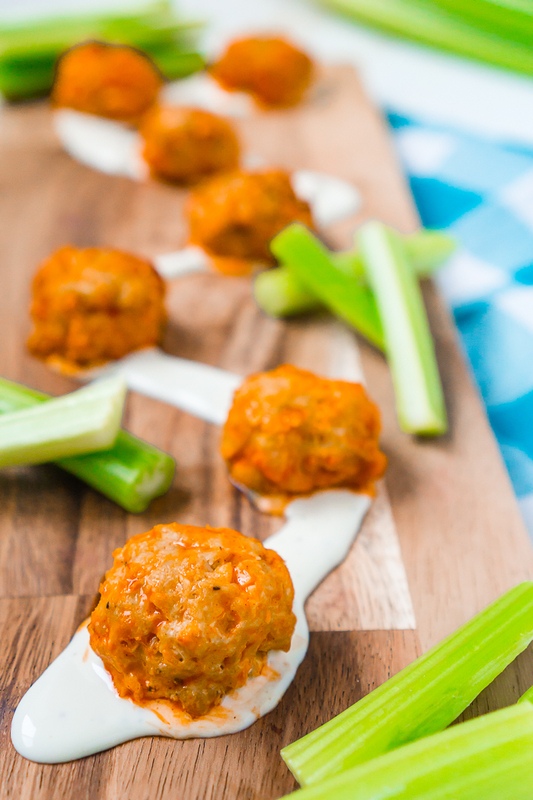 If you love buffalo sauce, then these Blue Cheese Stuffed Buffalo Chicken Meatballs should definitely make the menu for your next get together or game day celebration. Healthier and far less messy than buffalo chicken wings without losing any of the spicy flavor everyone loves! 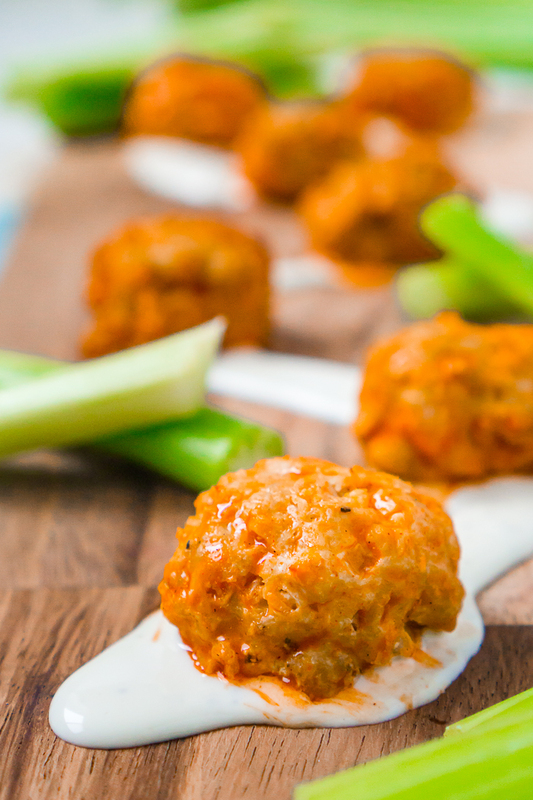 Slow Cooker Buffalo Chicken Meatballs Your Guests Won’t Be Able to Stop Eating! I am obsessed with buffalo sauce! We never did food with spice in the house growing up, so I never really had buffalo sauce until college when I was introduced to Buffalo Chicken Wings. It’s still one of my all time comfort foods! 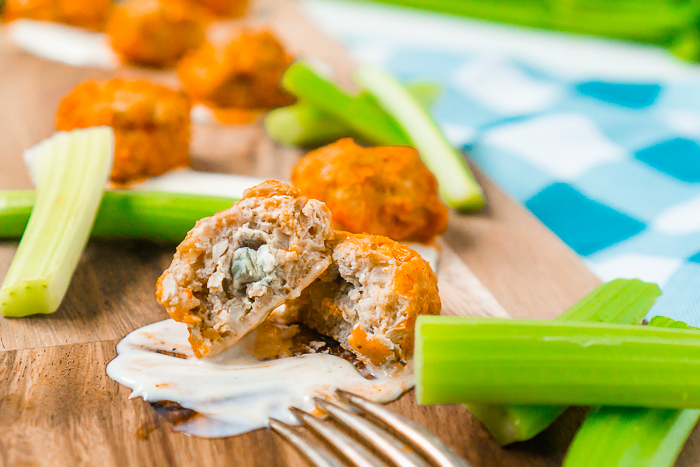 From Buffalo Chicken Dip and Buffalo Chicken Flatbreads to these Blue Cheese Stuffed Buffalo Chicken Meatballs, we always have a bottle of Franks Buffalo sauce in the fridge to satisfy our cravings with buffalo recipes. I love the heat you get without it being overwhelmingly spicy, especially when it pairs so well with a little blue cheese dressing or ranch. Boneless Buffalo Chicken Wings – my favorite – aren’t exactly the healthiest addition to a game day menu though, despite how tasty they are. Which is why I decided to try making Buffalo Chicken Meatballs instead! They are far cleaner to eat, healthier, and still full of all the flavor I want! I’ve learned to love the combination of blue cheese and buffalo sauce, so I decided to stuff a little bit of blue cheese into the center of these baked chicken meatballs. The flavor it adds pairs well but is subtle. You can easily skip this step if you don’t like blue cheese though without losing anything significant from the recipe. Prep a baking pan with sides with aluminum foil. Make sure to cover thoroughly for easy clean up afterward. You do NOT want to use a flat baking sheet without sides because it can lead to any cooked of fat and grease from the meat to fall to the bottom of the oven. It’s a huge mess! Soak torn bread in milk. I have used both white bread and whole wheat bread, so use whatever you prefer or have on hand. For one pound of ground chicken, start with 1/3 cup of milk and 1 slice of bread. If the milk isn’t soaked into the bread completely within 10 minutes, start ripping up a little more bread at a time until the milk is gone. Mix and mash the bread a little bit with a spoon, making sure the bread is completely moist. Dice your onions into small pieces. With small meatballs, you definitely don’t want big pieces of onion. Use a produce chopper or food processor to make the job easier. Add all your ingredients minus sauces or stuffings into a bowl to combine. Mix thoroughly. I make sure everything has been prepped, including a little bowl with any stuffing materials, and mix the meatballs with my hands. It’s the best way in my opinion to mix it all up and you are going to have to get your hands dirty anyway forming the meatballs. If you are adding a stuffing to the middle of the meatball, loosely form your meatball at about 1.5″. For these Buffalo Chicken Meatballs, I pushed a piece of blue cheese crumble into the center and then finished forming the meatball around it. Placing the meatball onto my pan when done. WHY DO YOU SOAK BREAD IN MILK FOR MEATBALLS? I find that soaked bread is the best way to get soft, moist meatballs. Dried breakcrumbs, which a lot of meatball recipes call for, always seem a bit more dense and dry than those made with a basic panade. A panade is the combination of a starch and a liquid that is eventually added to ground meat. You can use any combination of starch (bread, panko, crackers, etc) and liquids (milk, buttermilk, yogurt, stock) can be used. Buttermilk is actually a great liquid used for meatballs if you have it on hand, but milk still gives the meatballs a great texture. HOW LONG TO BAKE CHICKEN MEATBALLS? I prefer to bake my chicken meatballs at a slightly high temperature for a shorter amount of time, so 400 degrees F for 20 minutes, because I usually need recipes to be completed quickly. This bakes the chicken meatballs quickly without losing any of the flavor or moisture. You can also reduce the heat to 350 degrees F and cook for 35-40 minutes. Time to Enjoy Blue Cheese Stuffed Buffalo Chicken Meatballs! Tear up one piece of bread into small pieces and soak in the milk. Add more after 10 minutes or so if there is still more milk that needs to be soaked up. Prep 1 or 2 pans with aluminum foil before your hands get messy. You will want pans with sides so the grease doesn't spill in your oven. When the milk is soaked into the bread, mix all the meatball ingredients EXCEPT FOR THE BLUE CHEESE in a large bowl well. Form into small meatballs about 1.5 inches. Push a piece of crumbled blue cheese into the center and complete your formed meatball around it. Place meatballs on your prepped baking sheet at least an inch apart. Cook at 400 degrees F for 20 minutes, or until the meatballs are cooked through. I use a meat thermometer to check. Place cooked meatballs in fridge until you are ready to enjoy. You can also make larger batch and freeze for future use. When you are ready to enjoy, placed cooked meatballs in slow cooker. Refrigerated meatballs on high for about 2 hours and freezer meatballs on high for 3-4 hours. Reduce heat once meatballs are heated through.